A faded but elegant sofa has popped up recently on a busy Hintonburg sidewalk, a quiet Westboro street and a leafy Glebe park. Curious passers-by come to sit, stand and even jump on it. Kids and pets try it out. People ask questions and stay to chat; some pose on the couch for photos that are posted on a Tumblr site. 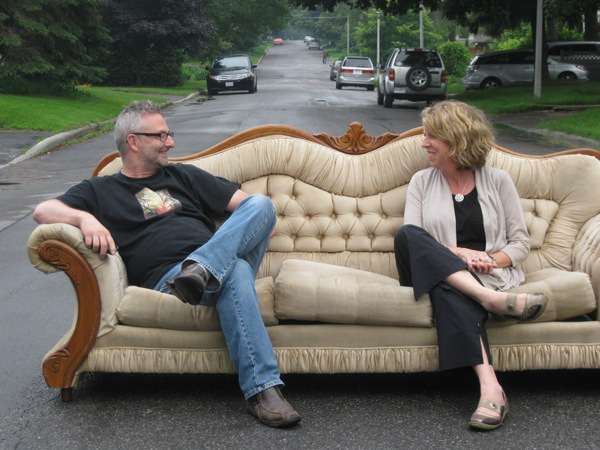 It’s the Community Couch, and buzz about it is spreading by word of mouth and through social media. Patti Church, who’s a Westboro resident, consultant and marketing and business professor at Algonquin, was interested in doing something innovative and community-oriented, so she approached Shawn MacDonell, a Glebe-based creative campaign developer and owner of Creativision, and Dwayne Brown, a Hintonburg resident, commercial and corporate photographer and community blogger. The three dreamed up the Community Couch project during a “beerstorming” at the Hintonburg Public House. Although they’ve each worked on creative initiatives, it’s the first time the three have collaborated, and the project is evolving as they engage with people and each other. “It’s organic,” says Brown. That interactive and flexible approach means that couch appearances aren’t announced in advance, although people can follow @communitycouch on Twitter for updates. When people come across the couch, they usually stop to find out what it’s all about. Church says that’s the idea—to get neighbours talking with each other. “This is about connecting people, and making memories for them,” explains the long-time community builder. “The fact that it’s a little odd and a little quirky makes it stand out a bit more,” says Brown, who’s done other interactive photography projects in the ‘hood. Brown says the idea is also to build bridges across neighbourhoods, so the couch will continue to pop up in Kitchissippi and surrounding communities this summer. The Community Couch benefits the co-creators as well as the community, they say. “To me it’s no different than going to a yoga class—it’s for me, and it’s not work. Except instead of going for a bike ride we put a couch in a truck and carry it around,” laughs Church. “We’re not doing this for money, obviously—we’re doing it for fun,” says Brown. The Community Couch team includes Patti’s daughter Kayla, who’s an aspiring photographer, and Maija Hirsimaki, who works with Brown. Other family and friends, and the Dovercourt Recreation Centre, have helped get the couch where it needs to go.